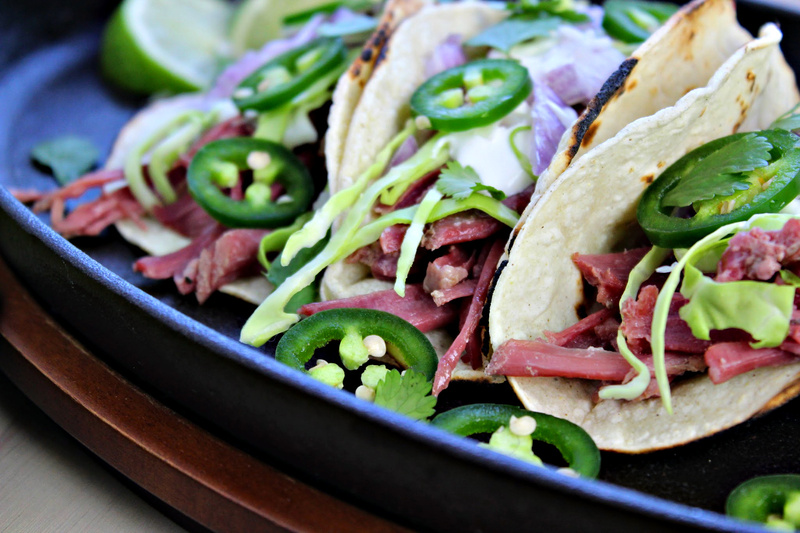 Here’s a recipe idea for your leftover corned beef roast – Corned Beef Tacos. I’ve always found it a bit strange that in our predominantly Latino community of Los Angeles we celebrate St. Patrick’s Day. Granted there are no parades like on the east coast, but it is definitely “celebrated” at all the local pubs. I’m wondering how many of those green beer chuggin’ Latinos know the history of the relationship between Mexico and the Irish. Did you know, for example, a group of Irishmen did come to the defense of Mexicoback in theMexico backmerican Wr from 1846 to 1848? The story is pretty complex so we won’t go into it here. But check it out when you get a chance. As I grew older, I found myself less tolerant of the idea of squeezing my way through an over-crowded bar (many with Spanish names) with obnoxious people screaming in my ears. I’d much rather be cooking a traditional Irish meal of corned beef and cabbage at home while sipping an Irish whiskey cocktail. 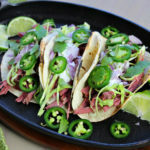 The week before St. Patrick’s Day the price of corned beef always goes down so I make sure to buy a large enough roast so there are leftovers for sandwiches and my new favorite – Corned Beef Tacos. Be creative with the cream sauce. In this recipe, we use media crema spiced with horseradish and freshly squeezed lemon juice. 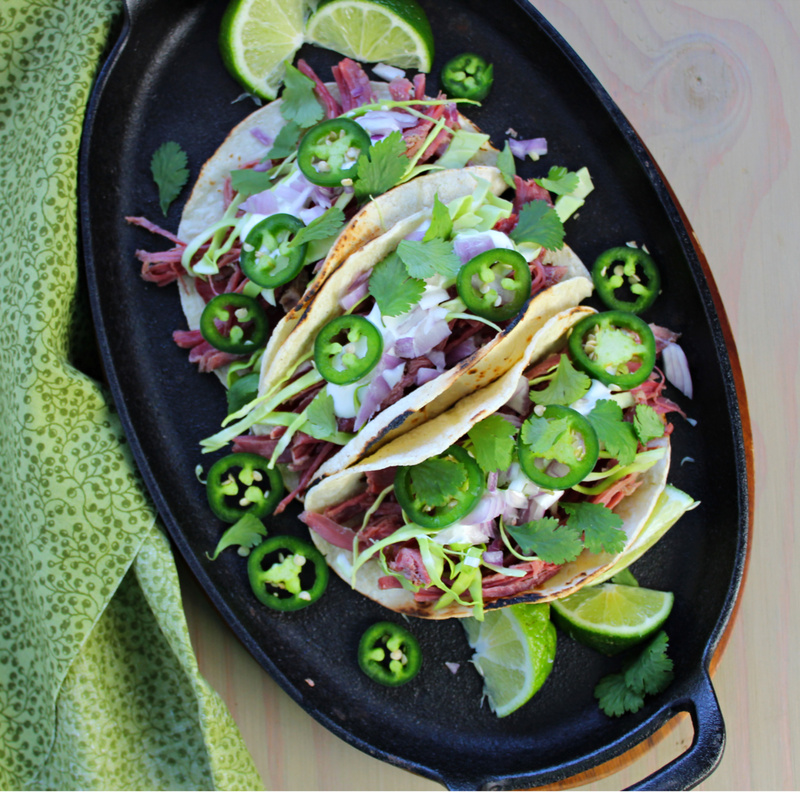 You’ll want plenty of sliced jalapeños, cilantro and limes nearby. Raise your glass and toast to San Patricio! 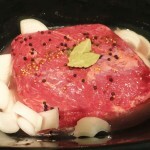 Place the corned beef with the fat side down into your slow cooker. Add the vegetables and black peppercorns and bay leaves. Fill the pot with enough water to just cover the corned beef. Cover and let slow cook on a low setting for 7 to 8 hours until the corn beef pulls away with a fork. Carefully remove the meat from the pot, as it will be extremely hot and tender. Set on a cutting board, and allow it to rest until it firms up a bit, about 10 minutes. Slice or shred to put inside your tortilla. Do not discard the cooking liquid, as you are going to want it to cook your cabbage. In a media sauce pan, strain out the vegetables and pour in the broth from the slow cooker. Add cabbage and let simmer for 10 minutes. Remove cabbage from liquid and drain. For the cream sauce, mix the media crema with the prepared horse-radish. Mix in your lemon juice to taste as well. Warm a corn tortilla. Place about 3 ounces of the corned beef in the middle. Top the meat with a spoonful of cabbage. 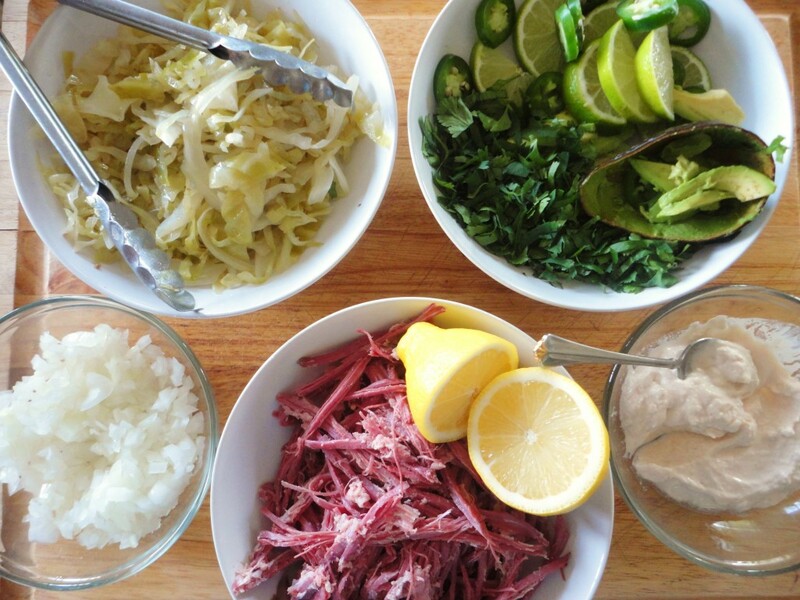 Garnish with onions, cilantro, and avocado. Place a dollop of the horse-radish cream sauce on top along with the slices of jalapeños. Enjoy St. Patrick’s Day Mexican-style!